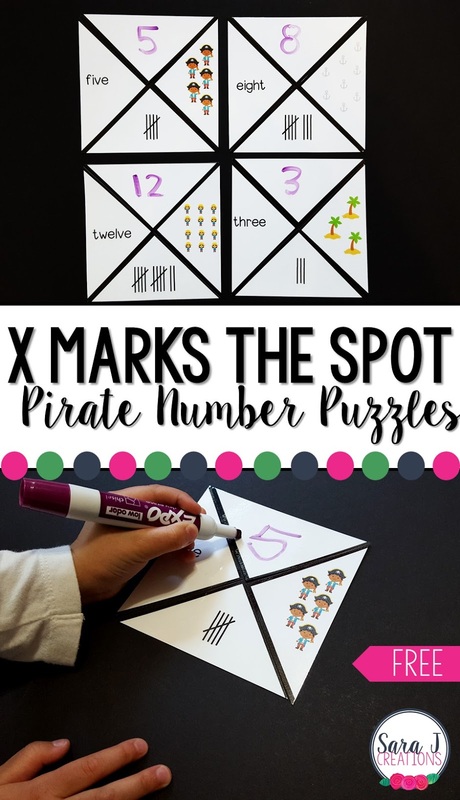 We are all about pirates this week and have a fun X Marks the Spot - Pirate Themed Number Puzzle FREEBIE for you today. After reading some of our favorite pirate books, it was time to practice writing and counting numbers up to 20. Of course, we had to do this with a pirate theme to make it even more fun. 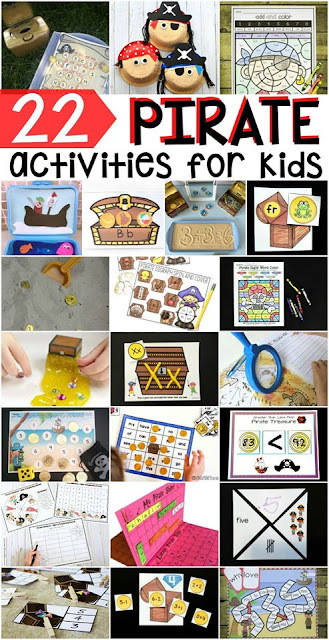 Pirates, treasure, ships, palm trees, parrots and more all made these puzzles more engaging. Print the pirate puzzles on white cardstock. Laminate for durability and to make a dry erase surface. Cut the puzzles into four pieces. Cut through the thick black lines so that when it is assembled, the puzzle will make an X for X marks the spot. Spread out the puzzle pieces and have students practice assembling the puzzles by matching the word, tally marks and pictures for each number. There will also be a blank piece in each puzzle. This is for students to use the dry erase marker and write the corresponding number. There are puzzles for numbers 1-20. When you cut those into 4 pieces you are going to end up with 80 triangles which can be overwhelming for younger children. Instead, pull out just the pieces for the numbers you want your students to focus on. We started with the smaller numbers and then focused on the double digit numbers. When the puzzles are put together correctly they should form a big X and include the number word, the number made out of tallies, the number made out of pictures and the number written by the student. To grab your own set of Pirate Number Puzzles, just click the "click to download" button at the bottom of this post, add your information and the puzzles will be emailed to you immediately. Are your kids on a pirate kick and needing some more pirate fun? Try some of these awesome pirate freebies from some other amazing bloggers.